The No.4 ranked University of Denver Pioneers (4-1) host the nation’s top-ranked Colorado College Tigers, coached by Scott Owens (left), in the renewal of one of college hockey’s best rivalries -- the pursuit of the Gold Pan Trophy. As usual, sellout crowds are expected in both arenas. Denver holds a 152-105-10 (.588) advantage over Colorado College in the storied rivalry that dates back to 1950. CC has held possession of the Gold Pan Trophy the last two seasons and owns a 6-2-2 advantage over DU in the last 10 contests. The Pioneers are 89-46-4 against CC in Denver and 60-59-5 against the Tigers in Colorado Springs. The Pioneers are 1-3-1 in their last five games against the Tigers overall and 1-3-1 in their last five games against CC in Denver. The Defending MacNaughton Cup Champion Tigers are led by goaltender Richard Bachman, and forwards Chad Rau, Eric Walsky (left) and Bill Sweatt. Bachman, the 2007-08 WCHA Rookie and Player of the Year, is 3-0-2 with a 0.97 GAA and .963 Sv% in 2008-09. Bachman, who has two shutouts, allowed three total goals in CC’s two ties last weekend at Clarkson. Rau leads the Tigers with 10 points on five goals and five assists and has long been a proverbial thorn in the Pios’ side with his ultra quick release and penchant for bagging shorties, while former UAA Seawolf Eric Walsky has eight points and speedster Sweatt five. Colorado College ranks No. 2 in the nation on the penalty kill at 97.7% (43-for-44). Head coach Scott Owens has posted a 227-121-27 mark in 10 seasons at CC. The Colorado College (familiarly known as CC) is a private, selective liberal arts college in Colorado Springs, Colorado. It was founded in 1874 by General William Palmer. The college enrolls approximately 2,000 undergraduates at its 90-acre campus, 70 miles south of Denver. While it shares many similarities with the arch rival University of Denver (Both private and expensive, both have national student bodies and both student bodies love skiing and hockey) the major difference is the orientation of the schools. CC focuses solely on liberal arts and is mostly undergraduate, while DU is a medium sized university with business, liberal arts and professional schools and a 50/50 undergraduate balance. Also, CC is a famously liberal school (albeit in a conservative city) while DU is more conservative as a school but situated in a more liberal city. Colorado College is known for its unusual "block plan," which divides the year into eight academic terms; a single class is taken during each block. Students study only one subject for three and a half weeks, which advocates say allows for more lab time, field trips, and other more intensive learning experiences. Blocks are only three weeks long in summer school, during which there are also graduate blocks of differing lengths. In parallel with the students, professors teach only one block at a time. Classes are generally capped at 25. The current President of the college is Richard Celeste, former Governor of Ohio, ambassador to India, and Director of the Peace Corps. Colorado College was instituted as a liberal arts college which would foster Christian outreach by its graduates and faculty in the New England tradition. Like many U.S. colleges and universities that have endured from the 19th century it now is secular in outlook, though it retains its liberal arts focus. The college's first building, Cutler Hall, was occupied in 1880; the first bachelor's degrees were conferred in 1882. Phi Beta Kappa was chartered in 1904. Under President William F. Slocum, who served from 1888 to 1917, the campus took the shape it held until the 1950s. Since the mid-1950s, the campus has been virtually rebuilt. 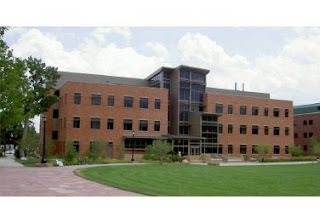 New facilities include three large residence halls, Worner Campus Center, Tutt Library, Olin Hall of Science and the Barnes Science Center, Honnen Ice Rink, Boettcher Health Center, Schlessman Pool, Armstrong Hall of Humanities, Palmer Hall, El Pomar Sports Center, and Packard Hall of Music and Art. Bemis, Cossitt, Cutler, Montgomery, and Palmer Halls are some of the remaining turn-of-the-century structures on the National Register of Historic Places, along with the William I. Spencer Center. CC’s sports programs are primarily NCAA D-III, except for hockey and women’s soccer, which are Division I. CC and DU were once fierce rivals in many sports, and the two schools played the first football game west of the Mississippi River back in 1885. CC won 12-0, but the victory was tarnished when CC later revealed that a number of players on that team were not CC students. Colorado College started playing hockey in the late 1930s when the Broadmoor Hotel converted its seldom-used indoor riding academy into an ice rink. The Broadmoor World Arena, originally called the Broadmoor Ice Palace, served as CC's home for 55 seasons before being demolished at the conclusion of the 1993-94 campaign. CC has done a remarkable job in building a powerhouse program when one consider the size of the school, the distance from hockey hotbeds (far) and the strong academics and liberal arts nature of the college . Making it even more special is the fact that the program almost went bust in 1994, when many years of losing seasons and escalating costs put the program at a crossroads. After brushing aside faculty members who called for the end of hockey, CC made a great hire in then coach Don Lucia, who took the Tigers back to the NCAA finals in just a couple of seasons, built a new arena with the help of the city and USA Hockey, and today, have enjoyed strong contender status in the upper echelons of the NCAA. Lucia went on to Minnesota, but CC has remained a contender ever since. However, ask many Denver Pioneer fans when CC won its last NCAA title and the answer “1957” comes quickly. Yes, Ike was still President when the Tigers brought home the hardware that year in beating Michigan, and the CC fans have been waiting ever since. The Tigers won the NCAA Division I championship twice during the formative years (1950 and 1957) of the NCAA tournament when it was always played in Colorado Springs, were runners up three times (1952, 1955, 1996) and made the NCAA Tournament eighteen times, including every year since 1995 except 2000, 2004 and 2007. In 2005, CC played in the ­Frozen Four against Denver in Columbus, but suffered a 6-2 setback when they could not stop the Denver power play that April afternoon. While the Tigers have been a strong program since the mid 1990s, there were many years of disappointing hockey between the 1957 NCAA title and Lucia’s arrival in 1993, as the Tigers had just four winning seasons and one NCAA appearance in that time span . Tiger Hockey officially made its debut on January 21 of 1938 in an 8-1 loss to a team sponsored by Giddings Department Store in Colorado Springs. Colorado College finished the campaign with three victories and nine defeats under playing coach and team captain John Atwood of Watertown, Conn. The program made significant strides forward the following season under new coach Garrett Livingston, whose leadership the next four years helped vault CC to national prominence. While several New England students with backgrounds in high school hockey joined the team, the strongest addition was Ernie Young of Saskatoon, Saskatchewan. When Young returned in the fall of 1939 for his second year at the school, he brought four more Canadian players with him - Jack Chamney, John "Chick" Ross, Wilmer "Spike" Wilson and Harold McClay -all from his home province. With Livingston at the helm, those players helped the Tigers sweep the University of Michigan, 4-2 and 4-3, in their first-ever intercollegiate series early during the 1939-40 season. Colorado College also played games against Colorado Mines, the Montana School of Mines and the University of Southern California, champion of the Pacific Coast League, that season. Enthusiasm reached a feverish pitch among CC hockey supporters for the next few years, with games at the World Arena selling out on a regular basis. By winter of 1942, the Tigers had earned a reputation as one of college hockey's "Big Four," along with USC, the University of Illinois and Dartmouth. Due to World War II, no games were played in 1942-43 or '43-44, but the sport was rejuvenated at Colorado College and nationwide in 1944-45. With the return of former players and the addition of seven more Canadians, the Tigers quickly were on the rise again. Cheddy Thompson, who came to Colorado Springs when he was assigned to 2nd Air Force Headquarters here, took over the coaching duties in the fall of 1945 and held the position for the next decade. In cooperation with the Broadmoor Hotel, Colorado College sponsored the first National Collegiate Athletic Association Hockey Championships at the end of the 1947-48 season. The tournament would be held at the Ice Palace for the next 10 years, with CC participating seven times - in 1948, '49, '50, '51, '52, '55 and '57. Thompson was at the helm when CC won its first NCAA championship in 1950 and finished as runner-up in 1952 and '55. He was named national Coach of the Year in 1952 by the United States Hockey Coaches Association. In 1951, Colorado College helped found the Mid-West Collegiate Hockey League, which changed its name to the Western Intercollegiate Hockey League in 1953. Other charter members were the University of Denver, Michigan, Michigan State, Michigan Tech, Minnesota and North Dakota. The WIHL evolved to become the Western Collegiate Hockey Association in November of 1959, with the present-day WCHA consisting of five of its original seven teams plus the University of Wisconsin, Minnesota-Duluth, St. Cloud State University and Alaska Anchorage. Four Colorado College coaches - John Matchefts (1968-69), Jeff Sauer (1971-72 and '74-75), Brad Buetow (1991-92) and Don Lucia (1993-94 and '95-96) - have earned WCHA Coach of the Year honors. Matchefts (2007) and Sauer (2003) both have been named recipients of the prestigious John “Snooks” Kelley Founders Award for their contributions to the overall growth and development of ice hockey nationwide. Lucia (1993-94) and Tony Frasca (1962-63) each were named national Coach of the Year by the U.S. Hockey Coaches Association. Still another, Bob Johnson (1963-66), went on to the National Hockey League where he guided the Pittsburgh Penguins to the Stanley Cup championship in 1991. Johnson earlier had served as head coach of the 1976 United States Olympic Team and of the NHL's Calgary Flames, as well as a three-year stint as executive director of USA Hockey. More than 20 former Tigers actually have played in the NHL, including recent Tigers Noah Clarke, Mark Cullen, Jack Hillen, Curtis McElhinney, Toby Petersen, Richard Petiot, Tom Preissing, Peter Sejna, Brett Sterling, Mike Stuart, Colin Stuart and Mark Stuart, who was a first-round draft pick of the Boston Bruins in 2003. Two Colorado College products – Red Hay with the Blackhawks in 1961 and Doug Lidster with the New York Rangers in 1994 and Dallas Stars in 1999 have had their – names engraved on the Stanley Cup. College lore has it that in the late 19th century, the CC Trustees made the decision in homage to Princeton University's tiger emblem. Nearly a hundred years after in 1994, a group of CC students began a campaign to change the mascot from the tiger to the greenback cutthroat trout, the Colorado state fish. When the subject came to a vote, the tiger won by a narrow margin: 468 for, 423 against. 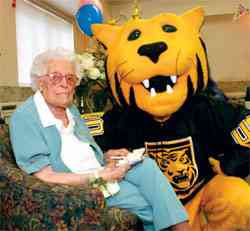 The Tiger mascot is named “Prowler. 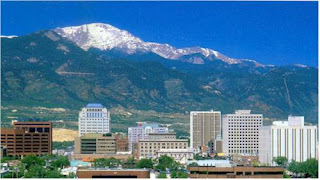 Colorado Springs is the county seat and most populous city of El Paso County, Colorado. At 372,437, it is the second most populous city in the State of Colorado behind Denver and the 47th most populous city in the United States. In 2007. the Colorado Springs area had population of 609,096. The city is situated near the base of one of the most famous American mountains, Pikes Peak, at the eastern edge of the southern Rocky Mountains. While noted for its exceptional natural beauty and climate, Colorado Springs is not exempt from the problems that typically plague cities that experience tremendous growth: overcrowded roads and highways, crime, sprawl, and government budget issues. Many of the problems are indirectly or directly caused by the city's difficulty in coping with the large population growth experienced in the last 20 years. It is a well known as a conservative city, as it is dominated by large military installations including Fort Carson, NORAD and the United States Air Force Academy, which make up the largest employers in the city. Also, a large percentage of Colorado Springs' economy is also based on high tech and manufacturing complex electronic equipment, second to the military in terms of total revenue generated and employment. Additionally, a large number of religious organizations such as Focus on the Family and churches make their headquarters here, particularly Evangelical Christians, as well as serving as the headquarters for the US Olympic Committee and many national sports governing bodies. Colorado Springs was founded in August 1871 as a residential community by General William Palmer (who also founded CC and co-founded the Denver and Rio Grand Railroad), with the intention of creating a high quality resort community to benefit from the mountain location, the railroad and the proximity to mining affluence from a previous gold strike at nearby Colorado City. The flow of gold and silver ebbed as the decades passed, and Colorado City's economic fortunes faded with it; the miners and those who processed the ore left or retired. Because of the healthy natural scenic beauty, mineral waters, and extremely dry climate, Colorado Springs became a tourist attraction and popular recuperation destination for tuberculosis patients. While CC has gotten the better of DU in the last few years in regular season action, DU still likes to point out that in the last DU/CC meeting in WCHA and NCAA playoff tournaments, it is the Pioneers who have emerged victorious. All of it fuels the long-held rivalry, which has taken on even greater fervency as both programs are nationally ranked. The Tigers like a fast up-tempo style of play with some very experienced and dangerous forwards, and with the high quality of goaltending and defense on the squad, there is no question why they were a consensus pick to win the WCHA. So far this season, the goaltending and defense have been fine, but the offense power everyone expected from CC has been largely fueled by the top line of Sweatt, Rau and Walsky, while the second and third lines have been less productive than expected. DU needs to particularly contain Rau and Mike Testuide (brother of Pioneers’ captain JP Testuide) who always seem to play exceptionally well against Denver. CC is going to be tested defensively, as they have not seen an offense this year as potent as Denver. The Pioneers on the other hand, have had great offensive success on three lines and from the defense, while the defensive and goaltending have been a little less stout than expected. Accordingly, DU hopes it can tighten up a bit on the backline, and CC is going to try and upgrade and balance the scoring output. Both teams have plenty of speed. All that said, emotion plays a big role in the series, and DU in recent years has not played at the same emotional level as CC has, and I am sure that coming off a tough loss to Ohio State and trying to get the Gold Pan back should help the Pioneers play at a higher emotional level. I also think the Tigers will come into the series with a high level of emotion as they have for the last few years. Looking at the quality of players on both benches, I think we’re in for a split, with the Pioneers getting the first one in Denver and CC getting revenge at home. I am predicting a 3-2 Pioneer victory on Friday and a 4-2 CC win on Sunday. CC this year seems to have a little more trouble on the smaller rink, while Denver has yet to play on a large surface this year. DU sweeps 19-5 & 7-0. Thanks for the run Swami! I do think losing to OSU last Saturday will have defiantly out some heat into the practice sessions with Gwoz this week. I expect Du to come out flying offensively. If they can get a pair by Bachman in the first frame I'd say were in for a W.
The big sheet game Sunday should be really exciting. If you're a DU fan and your not making the trip I'm thinking you're not really into hockey. Maybe you should look into something a little more low key! I'm right behind the DU attack twice net! This is just brilliant stuff. Keep it up!